Sycamore coffee table, our motto, never give up, the more hills we climb the better the view, this year has not been the best year from a business point of view, but for our customers however stuck by us. we would like to take the time to thank you, especially Mark Peaker whom has waited months for a sycamore coffee table, which originally was a cedar slab which was destroyed in the fire the day before delivery. we do our utmost to deliver, time is taken to find the perfect slab of timber from the smallest to the largest being 4ft x 12ft in size, our customers orders were delayed in the summer when Fletch had blood poisoning and was in hospital for sometime, a small injury in the workshop that within 48 hours became life threatening. our workshop was destroyed by fire, everything was lost, many years of hard work gone in 30 minutes, tools that had become like old friends lost, but most of all customers orders ready to be delivered and all of our stock of timber never to be replaced lost along with another sycamore coffee table we were about to deliver. We never thought that we would ever be able to afford to start up again and replace the sycamore coffee table. However after nearly throwing in the towel, we can happily say, we moved premises and have honoured our commitments, the picture below is a sycamore coffee table on a iron stand with a 10mm glass cover plate designed by our customer. so some things do not happen overnight, however we guarantee that we will work towards your exact we hope to do this in 2012 with slightly less mishaps. 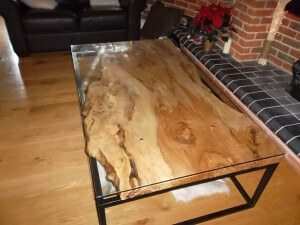 If you are interested in a simular sycamore coffee table please do not hesitate to contact us.